I had a lovely dinner with my college friends at one of newly-opened Filipino restaurants at The Fort: Sarsa Kitchen + Bar by celebrity chef JP Anglo. I was told beforehand that I should call for reservations, because this place can get really jam-packed during lunch and dinner. True enough, there was a queue outside the restaurant. However, the server was kind enough to get our orders as we wait for our table. We only waited around 15 to 20 minutes for our table. For appetizer, we munched on the free cornick and the Crispy Dilis (Php 120), with chili pineapple glaze. The spiciness was bearable and the flavors made better by the pineapple. Loved it! Celebrate back-to-school season at Manang’s Chicken. For the third consecutive year, you can enjoy great savings and freebies on your favorite Manang’s Chicken meals with the Pabaon ni Manang coupons. 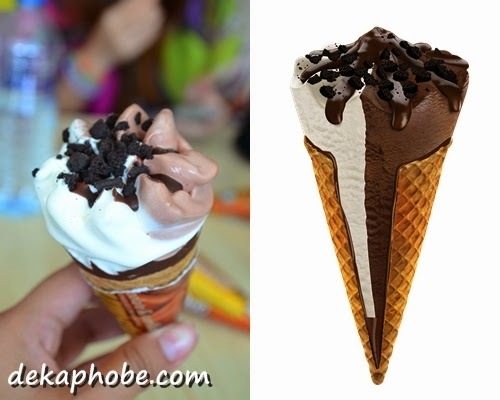 Present it upon ordering and get free items such as Vanilla Sundae Cone, 1.5L Pepsi or Cheezy Spaghetti. Coupons also entitle you to a free drink upsize, waiver of P40 delivery fee or 5% discount for orders amounting to P500 above. 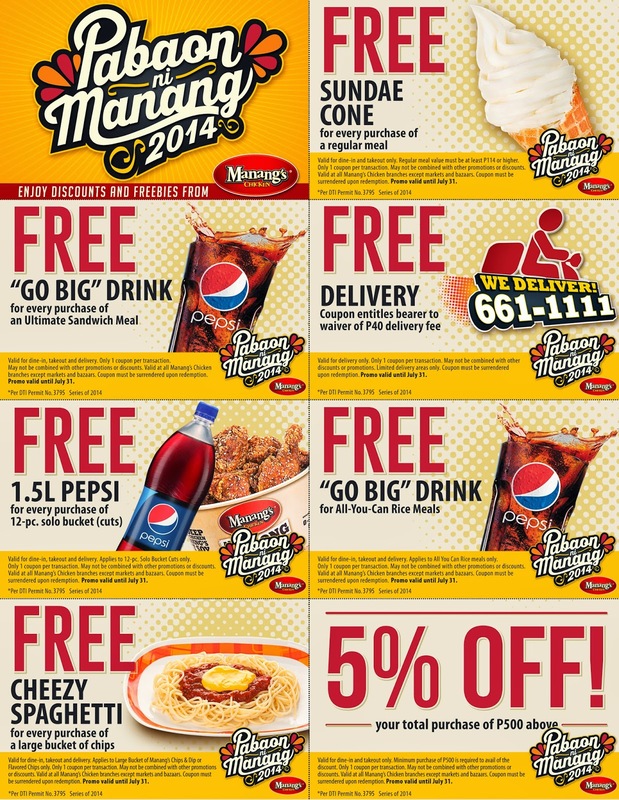 Get these Pabaon ni Manang coupons at the branch nearest you or print them out from this website or through Manang's Chicken website and Facebook page. 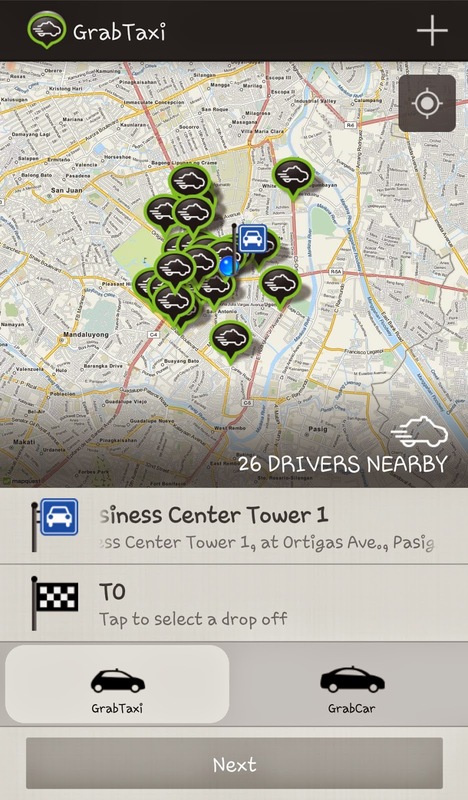 Coupons can be used for dine-in, takeout and delivery orders from June 1 to July 31, 2014. Only one coupon can be used per transaction. Manang’s Chicken branches are located at Jupiter St. Makati, Glorietta Food Choices, Ortigas Center, Katipunan Avenue, Tomas Morato, Puregold Cainta-Junction, SM North EDSA, SM CITY Dasmarinas, Taft Avenue, The District Cavite, Ever Gotesco- Recto, SM Fairview and Gaisano Mall of Davao. Visit www.manangschicken.com or www.facebook.com/manangschicken for more details. After our visit to The Spa, Mr. B and I went to Green Pastures for a late lunch/early dinner. I last visited Green Pastures a few months ago, and I was so excited to try their salads. Yes, I really love Green Pastures for their salads. I ordered my favorite drink, the Organic Melon Green Tea (Php 100 per glass, Php 155 for refillable) while Mr. B chose to have Calamansi Juice (Php 100 per glass, Php 145 for refillable). I love how the egg yolk makes the fern salad taste better, that's why I always have it whenever I eat at this resto. Founded in 1996, The Spa is a very popular wellness center with multiple locations around Manila. For our spa sessions, we went to Shangri-la East Wing branch. Each location has different rooms / accomodations. The Shangri-la branch has suites / villas, with prices slightly higher than the deluxe or executive rooms (available in other locations). There comes a time that we need to face something head-on without knowing what to expect. 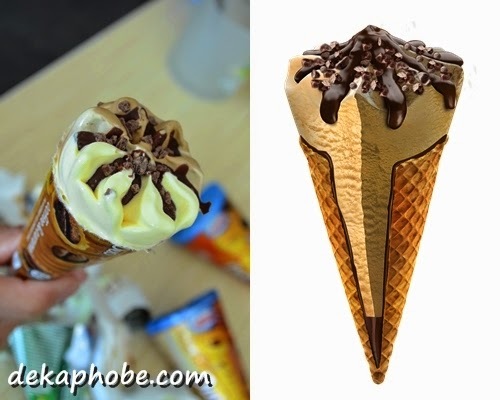 Like the newest flavors from Nestle Drumstick, each new flavor has wonderful combinations filled with a surprising twist in each bite. I must dare say that these fantastic flavors are not for the boring. The Drumstick Duo flavors Coffee & Caramel and Chocolate & Vanilla, are both filled with two ice cream flavors in one crispy wafer cone. The Coffee & Caramel is topped with chocolate pieces while the Chocolate & Vanilla is topped with Crushed Cookies. Chicken is the only meat that I can eat everyday. Of course, I do love pork, beef and fish, but I can't live without eating chicken. My chicken cravings led me to two places I have visited and loved before: Red Buffalo and Boon Tong Kee. A yearning for a taste of Hainanese Style Chicken made me urge my friends to have lunch at Boon Tong Kee, SM Mall of Asia. Unlike the crowded Tomas Morato branch where I went to a few months back, the place was practically empty, maybe because it was a weekday. We indulged with their Signature Boiled Chicken (Php 455 for half) with their Chicken Rice. We also had Fried Sole Fillet in Black Pepper Sauce (Php 295), though my friend requested that the sauce be served separately. The food was so delicious, and the service was outstanding that we didn't mind the poor ventilation during the visit. Boon Tong Kee will always be my go-to places for authentic Hainanese chicken.